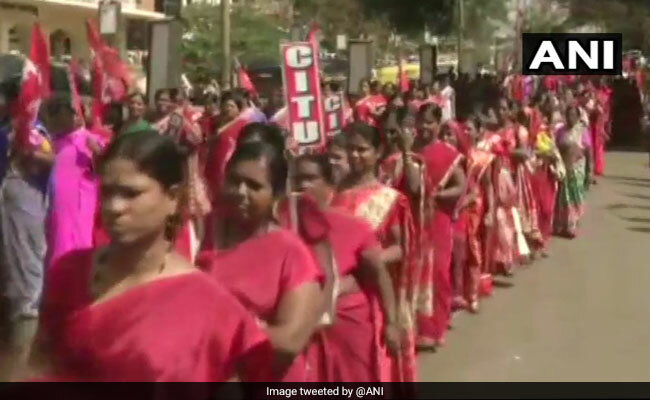 Bharat Bandh Highlights: As many as 10 Central Trade Unions with at least 20 crore workers affiliated to them have joined the strike. The two-day nationwide bandh is in protest against government's alleged anti-worker policies. Central Trade Unions or CTUs have launched a two-day nationwide bandh in protest against the government's alleged anti-worker policies and unilateral labour reforms. As many as 10 CTUs with at least 20 crore workers affiliated to them have joined the strike. The 10 CTUs going on strike include INTUC, AITUC, HMS, CITU and AIUTUC, among others. RSS affiliated Bharatiya Mazdoor Sangh or BMS will not participate. In a joint statement, the CTUs alleged that the government undermined tripartism and continued its "aggressive attack with arrogance on the lives and livelihood of the working people." They also oppose the proposed amendments in the Trade Union Act, 1926, saying those are irrational and extremely damaging to the independent functioning of unions. The unions claim that farming communities through their associations have also extended support to the strike. Student and teacher organisations of various universities have also declared support, the statement said. Trains were stopped in Thiruvananthapuram, Tripunithura, Shoranur railway stations, and were running late. The Kerala State Road Transport Corporation (KSRTC) could not operate most of its fleet of buses. Sabarimala pilgrims, tourists, social and religious functions have been exempted from the strike. In Kerala, offices reported low attendance, schools and colleges were shut and banking services affected. According to bank unions, 22,000 bank employees participated in the strike. The State secretariat reported very low attendance. Though trade unions had promised that vehicles would not be blocked and shops and business establishments not forcibly shut, there were reports of some shops being forced to down shutters. The mining activities in the Chhattisgarh were partially affected, production was completely stalled in the Manikpur coal mine of state-owned South Eastern Coalfields Limited (SECL) in Korba district while it was partially affected in Kusmunda, Gevra and Dipka coal mines of the district. Transport service were unaffected and schools and colleges also remained open across the state. Agitators held protests at several place in the state capital Raipur. No untoward incident was reported so far in any part of the state. Banking and postal services were partially affected in Chhattisgarh. Employees of some of the major banks, insurance companies and post offices joined the strike, which evoked a mixed response in the state. 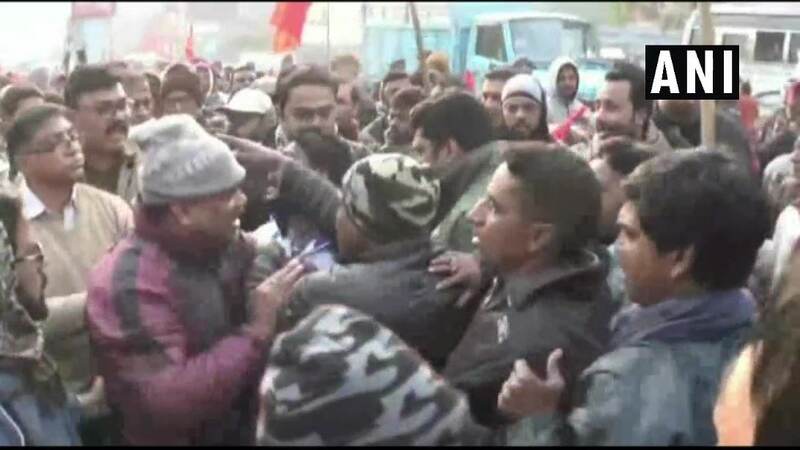 "Employees of coal, steel, power companies, banks, insurance firms and those working in other organised and unorganised sectors joined the strike," Centre of Indian Trade Unions (CITU) state secretary Dharmaraj Mahapatra said. 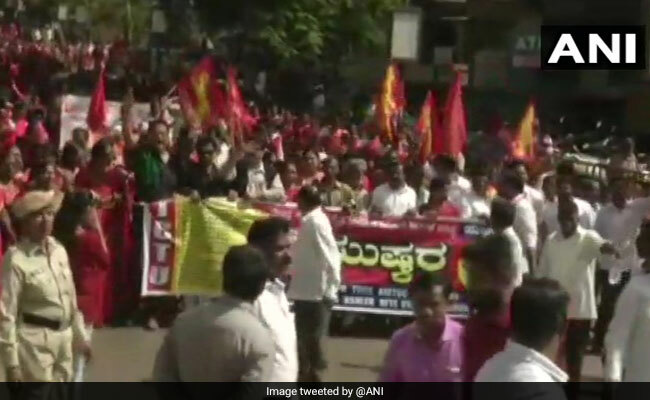 The two-day nationwide strike called by trade unions against the alleged repressive labour policies by the Narendra Modi government evoked mixed response in Karnataka on Tuesday. While buses of the Karnataka State Road Transport Corporation (KSRTC) stayed off the roads in most parts of the state, causing inconvenience to the people travelling to distant places, private buses, auto, taxi and metro services were available as usual. Mixed response to strike have been reported so far from Mysuru, Mangaluru, Hubballi-Dharwad among others. In many districts, holiday was declared in schools and colleges, with examinations being postponed. Banking operations were affected in some parts of the country on Tuesday as a section of employees did not work in solidarity with the two-day nationwide strike call given by 10 central trade unions to protest against alleged anti-labour policies of the Narendra Modi government. All India Bank Employees' Association (AIBEA) and Bank Employees' Federation of India (BEFI) have supported the strike, which has impacted banking operation where these two unions are strong. However, the operation in State Bank Of India and private sector banks remained unaffected as other seven unions in the banking sector are not part of the strike. At Jadavpur in south Kolkata, senior CPI(M) leader Sujan Chakraborty along with several other strike supporters were detained by the police. 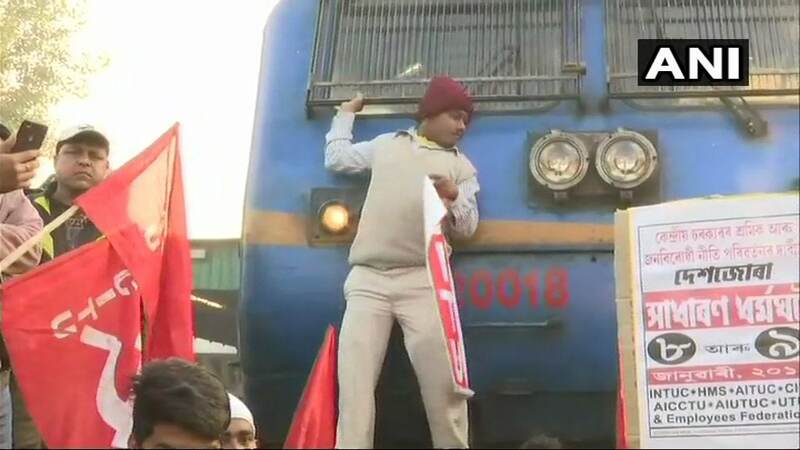 Protestors squatted on tracks in some places to stop trains and burnt tyres on the roads. "Successful People's strike...Indiscriminate arrest," Mr Chakraborty tweeted, accusing the Mamata Banerjee-led Trinamool Congress government in West Bengal of serving PM Modi against the "people's voice". The Trinamool Congress government in the state has opposed the strike call. Employees attached to the Government Press took out a protest march at midnight in Kerala's Thiruvananthapuram. 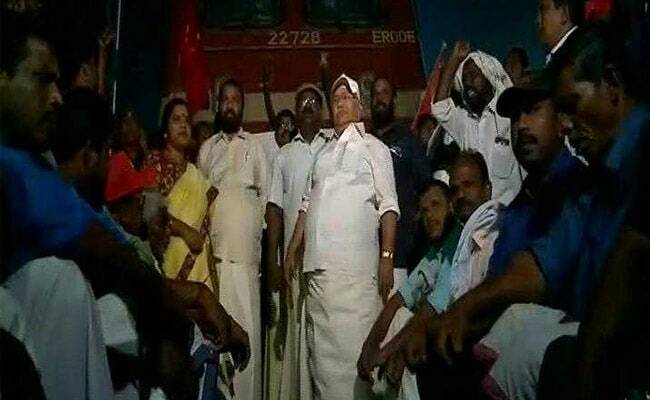 Protesters blocked railway tracks across Kerala due to which many trains were running behind schedule. 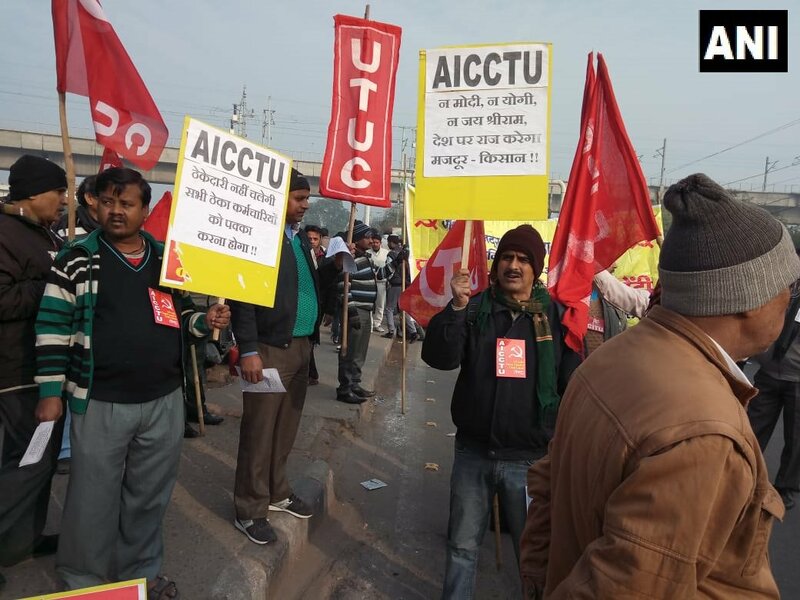 Members of the All India Central Council of Trade Unions (AICCTU) hold protest in Delhi's Patparganj industrial area. Clashes erupted today between members of the Trinamool Congress and workers of the CPM in Asansol today. The Trinamool Congress government in West Bengal has opposed the 48-hour Bharat Bandh call. 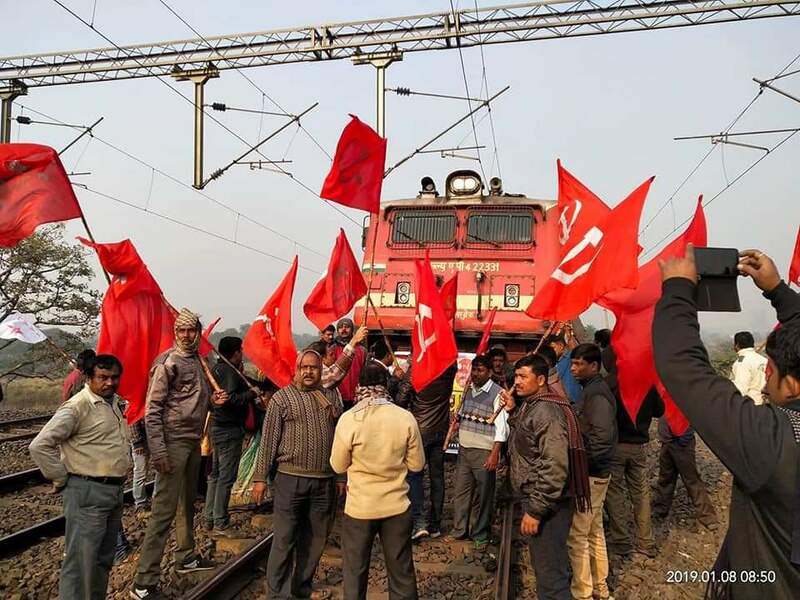 Rail-blockades in many railway stations and sporadic incidents across West Bengal districts partially hit normal life amid the Bharat Bandh. Train services were disrupted both in Howrah and Sealdah division of the Eastern Railway and also South Eastern Railway. 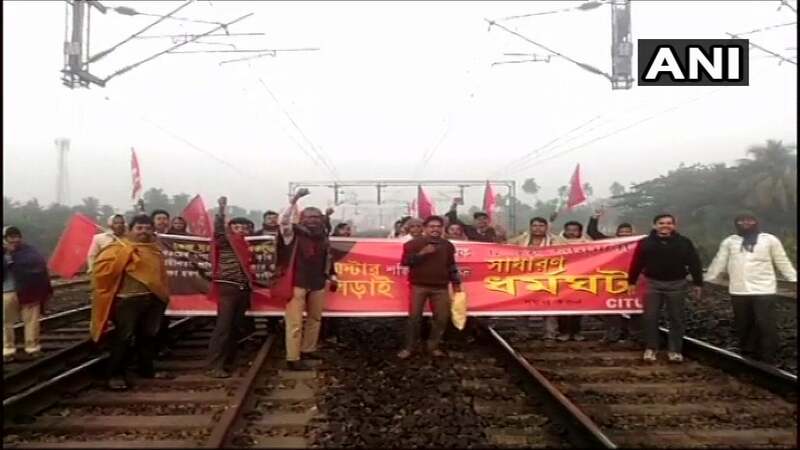 The strike supporters put up rail blockades and clashed with the police in many stations in the suburbs in South 24 Parganas district's Lakhikantapur, Canning; North 24 Pargans' Madhaygram, Hasnabad and Barasat. 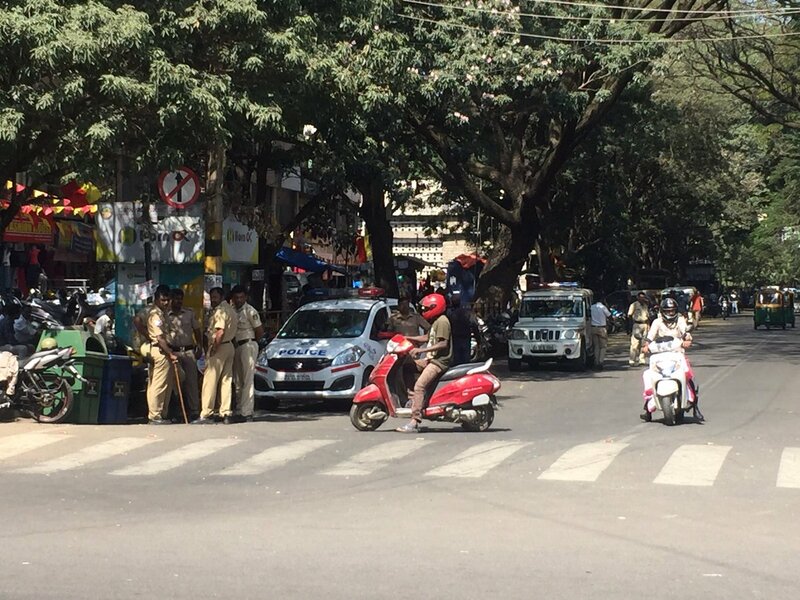 Additional police personnel have been deployed throughout the state to prevent any disruption or violence in connection with the strike. 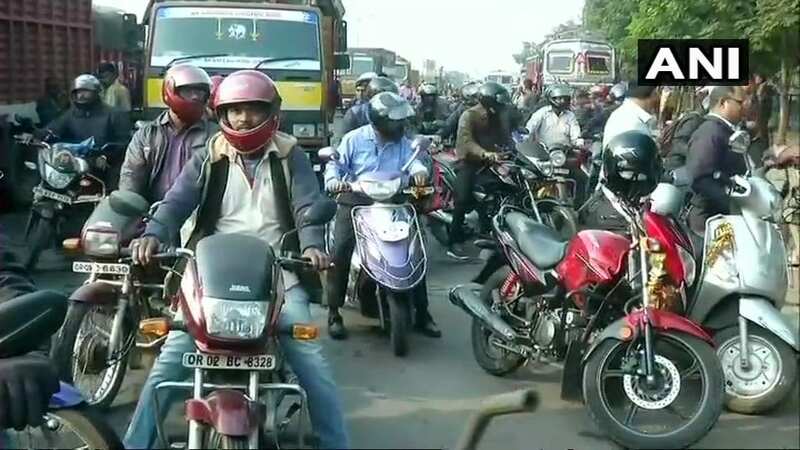 Traffic movement was affected today at the National Highway 16 in Odisha's Bhubaneswar over protests led by members of various Central Trade Unions. 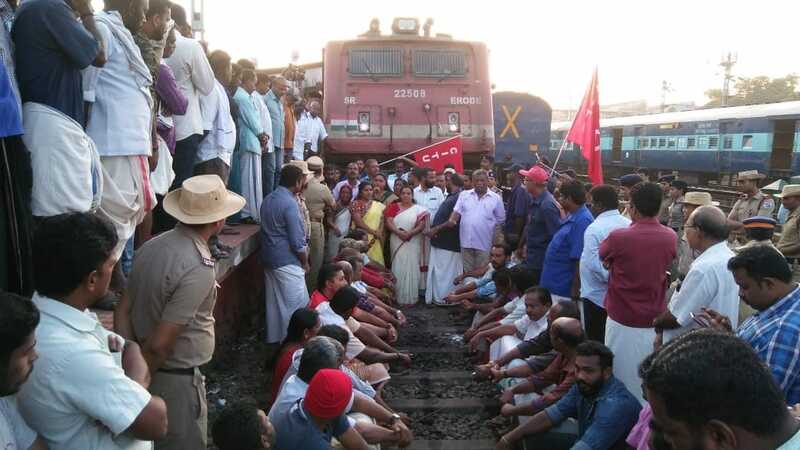 Strikers in Thiruvananthapuram block railway lines as part of the 48-hour Bharat Bandh called by various Central Trade Unions. 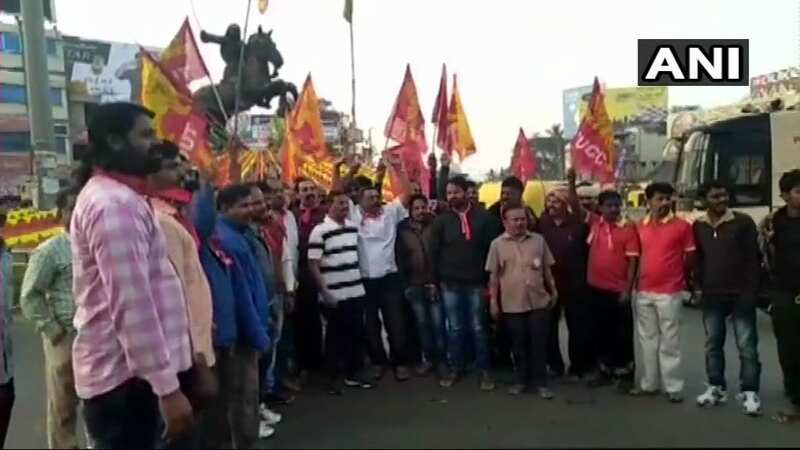 Visuals from Karnataka's Hubli as members of Central Trade Unions are protesting today against privatisation of the public and government sector. A school bus in Barasat, 30 km from Kolkata, was vandalised today as several workers of Central Trade Unions have launched a Bharat Bandh. Two students were in the bus as it was vandalised. No injuries were reported, however. Strikers also clashed with police at a bus stop in Jadavpur. Incidents of bus vandalising were also reported from Asansol and Hind Motor in West Bengal. 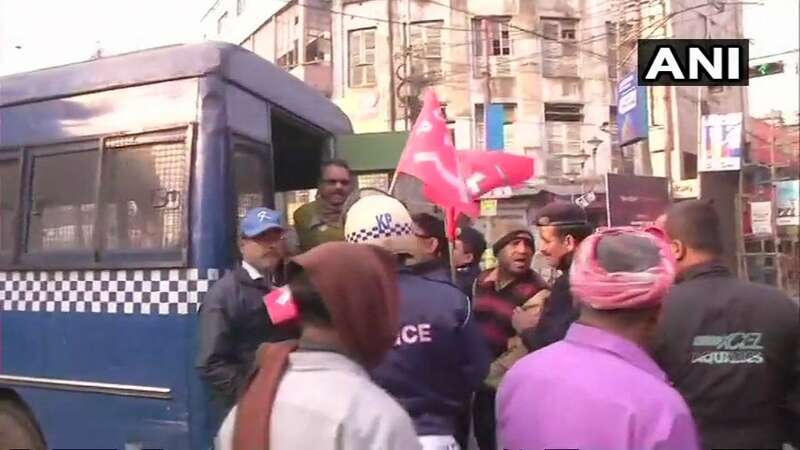 Police in Kolkata detained workers of the CPM who were protesting in support of the 48-hour Bharat Bandh. 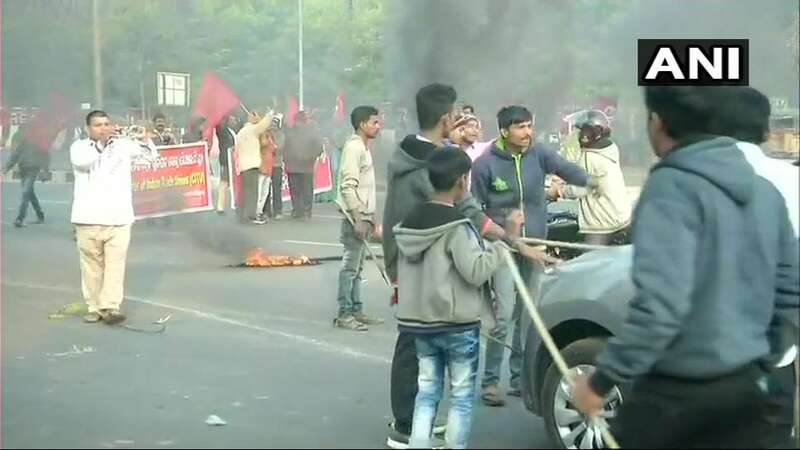 In Odisha's Bhubaneswar, members of Central Trade Unions blocked commuters amid protests called against alleged anti-worker policies and unilateral labour reforms of the Centre. In West Bengal, members of Central Trade Unions blocked railway lines in Howrah today to press their demands. The West Bengal government has already announced that its employees would be barred from availing casual leave or half-day leave today and tomorrow as members of various Central Trade Unions are striking to protest "anti-people" policies of the Narendra Modi government. 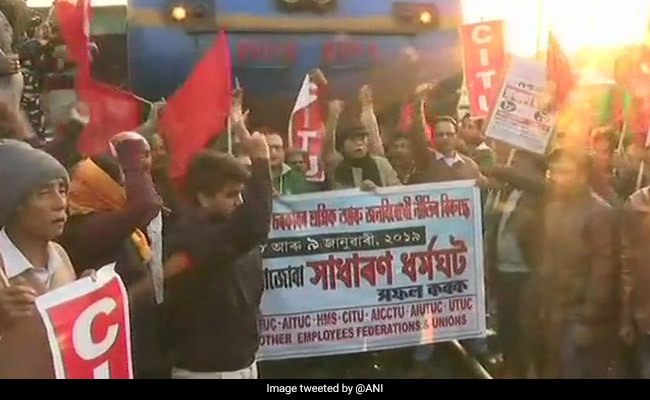 Here are visuals from Assam's Guwahati as Central Trade Unions have called a two-day nationwide strike demanding minimum wages and social security schemes among other demands.